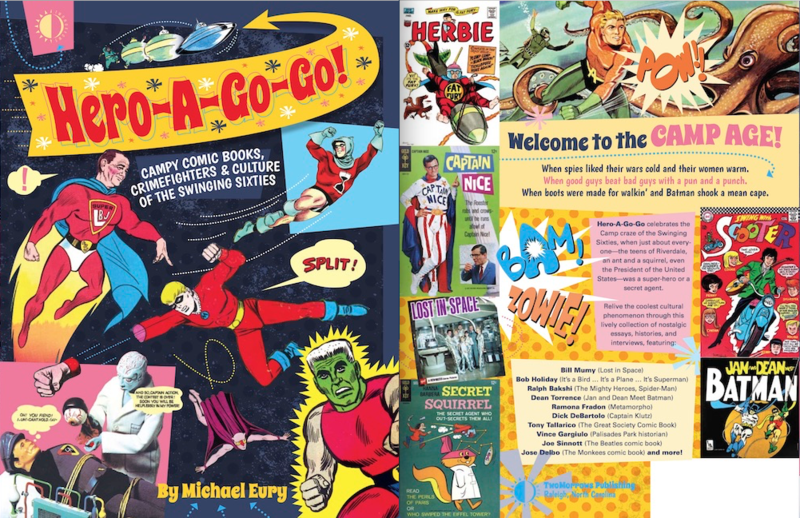 Every Saturday for 13 weeks, we’re serializing Back Issue editor Michael Eury’s upcoming book Hero-A-Go-Go! — a ginchy exploration of the Silver Age and Swingin’ Sixties. For other installments, click here. Hero-A-Go-Go! is due 4/19. You can pre-order it here. I have had the Monkees on the brain a lot lately, listening to not just the classics but the new album Good Times, which is excellent by any measure. But why write about that at a comics site? I suppose we’re all daydream believers, huh? Micky and his pals were the hottest thing since the Beatles—and publishers wasted no time taking the first train to Clarksville. As you’d expect, the teen mags flipped over the Monkees, and Davy, Mike, Peter, and Micky began to dominate their covers. 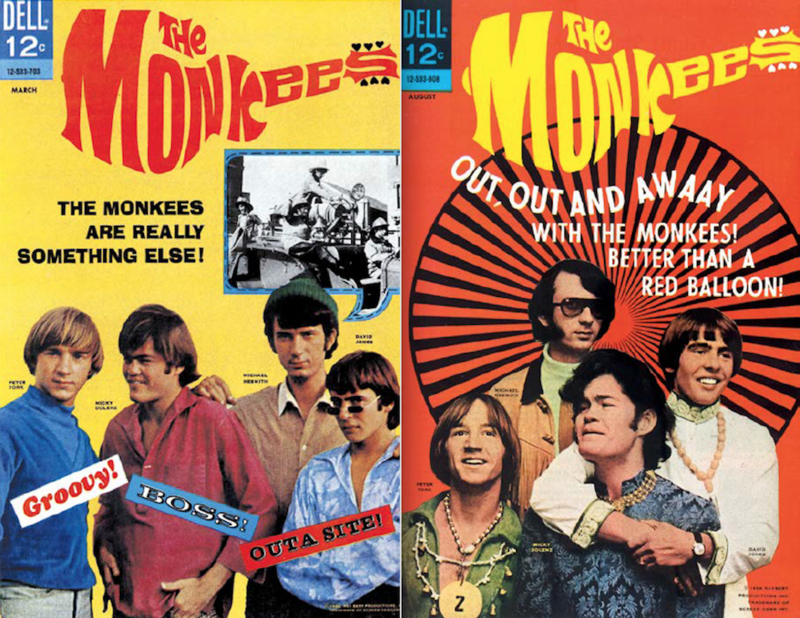 Special Monkees publications raced into production, from magazines to paperbacks, both in the U.S. and abroad. 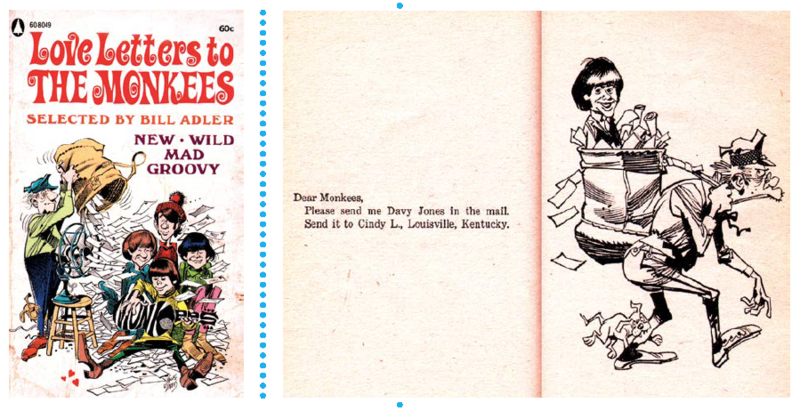 Three Monkees paperbacks from Popular Library are of special interest to comic-book fans. 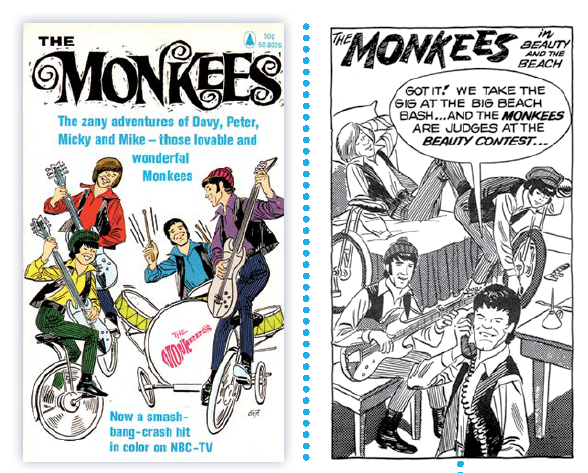 The Monkees , a quickly produced volume featuring black-and-white comics stories written by Howard Liss and illustrated by Gene Fawcette, was issued in 1966 on the heels of the TV show’s premiere. The writer and artist were working from the series’ earliest available materials, most notably the pilot episode, evidenced in the interior stories with Mike Nesmith being called “Wool Hat,” his name in the pilot. Fawcette’s caricatures of the band were sharply rendered, although since the Monkees were new at the time of this publication, we’ll forgive the cover colorist for making Mike’s wool hat red instead of green. (In 1967, this paperback was reissued in England by the Daily Mirror as The Monkees Crazy Cartoon Book .) Also in 1967, Bill Adler, who had CRASH!ed the Batmania party the previous year with Bill Adler’s Funniest Fan Letters to Batman, collected more “new, wild, mad, groovy” fan mail and produced Love Letters to the Monkees, featuring hilarious illustrations by the incomparable Jack Davis. Lastly, another 1967 paperback was The Monkees Go Mod, a far-out collection of short features about the band, including some Monkees cartoons by Richard Hodgens. Second only to the original Fab Four’s comics appearances, unauthorized cameos of and references to the Monkees were all over the comics racks. 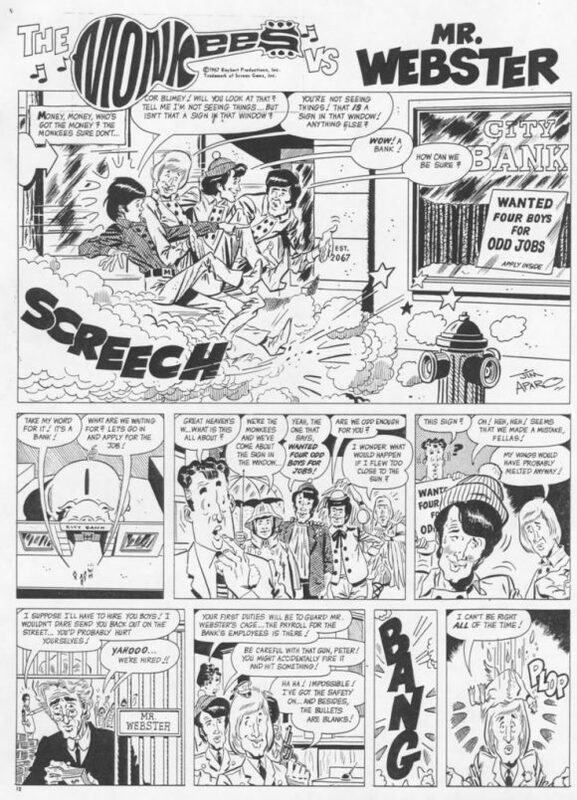 The boys were spoofed in the parody comics of the day, including Marvel’s Not Brand Echh, where you might find the Monkees cavorting with celebrities and superheroes; NBE also featured Monkees jokes, such as the Ecchs-Men listening to the Monkees’ theme in issue #4. Scott Summers, a.k.a. Cyclops, was surprised to discover that his hangout, Pizza Paradise, had been turned into a discotheque named the Monkee’s Paw. Amid this monkey business emerged the authorized comic book starring the fast-rising super-stars who were “something else” — not to mention, “groovy,” “boss,” and “outa site.” On December 1, 1966, Dell Comics released the first issue of its ongoing series, The Monkees. The art on Dell’s Monkees stabilized with the second issue, as Arneson hired Jose Delbo for the book. 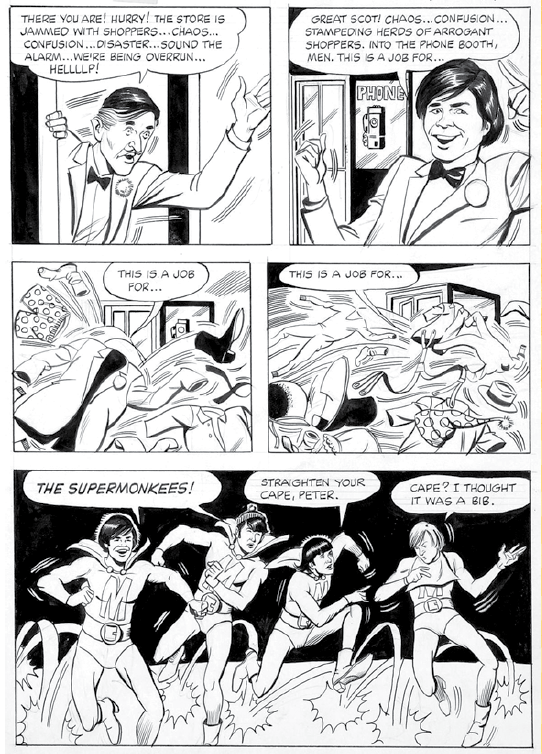 Delbo drew the series in a cartoony style, suiting the nonconformity of the scripts Arneson was producing, which featured the Monkees tangling with spies, the Monkees as cowboys, the Monkees as superheroes (the Supermonkees, incidentally, not the Monkeemen made famous on the TV show), the Monkees encountering an abominable snowman, that sort of thing, all produced without licensor interference or approval. Each issue featured photo covers and interior short stories. The Monkees was one of Dell Comics’ saving graces during a shaky period when the publisher’s once-mighty comic-book line was shrinking. 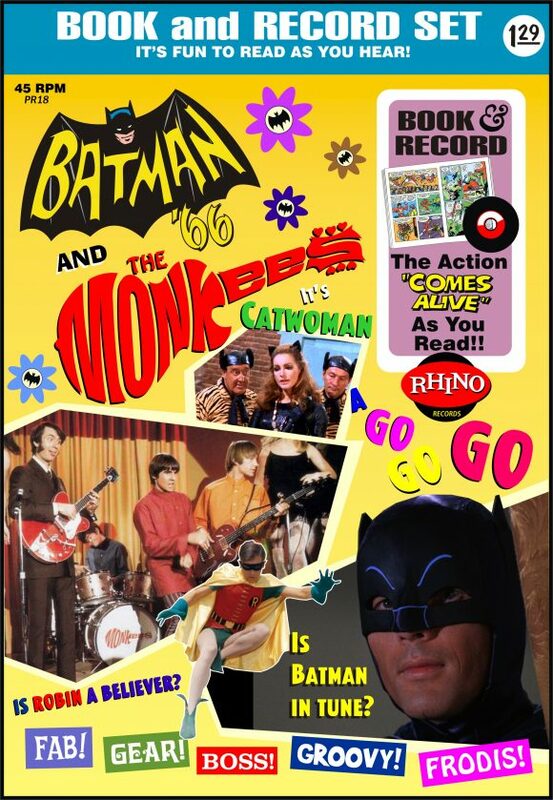 When Monkeemania was on the decline, Dell’s comic was cancelled with issue #16 (Nov. 1968), although around a year later, one more issue, #17 (Oct. 1969), was released, reprinting The Monkees #1. Concurrently, a lesser-known but intriguing comics version of the Monkees was published by Charlton in 1967 — in one of its song lyrics magazines. Teen Tunes and Pin-Ups #3 featured a two-page, black-and-white Monkees strip written by Steve Skeates and drawn by future Batman artist Jim Aparo. Issues #4 and 5 of the mag also featured Monkees stories by Skeates and Aparo, and all three Charlton short stories bore the title of a Monkees tune. NEXT WEEK: Marvel’s cartoons of the ’60s! Click here. You can pre-order Hero-A-Go-Go! here. The major problem I had with the Dell Monkees’ books is that the writers thought all the Monkees did you their television show was change from one costume to the next. Pages in some of the Monkees’ book showed the guys in four or five outfits, and the pages only had six panels. Indirectly the writers got a feel for the TV series, but the constant changing of costumes was very distracting. Yes, the Monkees did have fantasy sequences where there would be a cutaway and the guys would have on different costumes. But not like the Dell comics.